As digitization drives a new wave of productivity, manufacturers are leveraging supply chain trends into their business networks for executing coordinated processes. This has given birth to modern Supply Chain Management (SCM) which is much more connected, rapid and scalable, and boosts collaboration in an organized and informed manner. Powered by artificial intelligence and advanced predictive technologies, manufacturers are today implementing SCM solutions that can effectively manage operations and model future scenarios. Moreover, blending mega trends with agile SCM methodologies, organizations can collect, streamline, and analyze data from multiple touch points across a supply chain lifecycle to derive business insights and make informed decisions. Such an effective SCM ensures lower distribution costs and reliability of inputs, while enhancing supplier and customer integration. 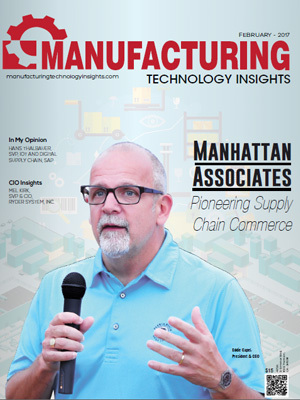 Today, with an outburst of advanced SCM solutions, manufacturers are vigorously looking for reliable SCM experts and technology-enabled solution providers to transform their supply chain life cycle and accelerate business value. 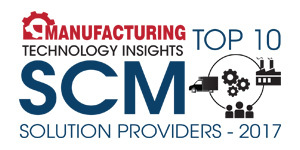 In order to assist manufacturers identify and implement the right SCM solution that best fits their needs, Manufacturing Technology Insights presents the “Top 10 SCM Solution Providers 2017.” This edition features the best solution and service providers offering tools and services in the SCM landscape. 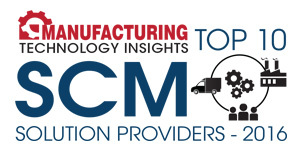 A distinguished panel comprising CEOs, CIOs, VCs, analysts, and the Manufacturing Technology Insights’ editorial board reviewed the best companies in the SCM solutions domain and shortlisted the top 10 that are at the forefront of tackling SCM challenges. The listing provides a look into how these solutions work in the real world so that organizations can gain a comprehensive understanding of what technologies are available and how they add value to the manufacturing domain. We present to you Top 10 SCM Solution Providers 2017.